The derby action returns to Canterbury Expo Center in Shakopee! Not rain, nor sleet, nor snow will keep us from hitting the track (and each other!). Hopefully, we won’t have to deal with any more of them for this post-Paddy’s Day derby party. 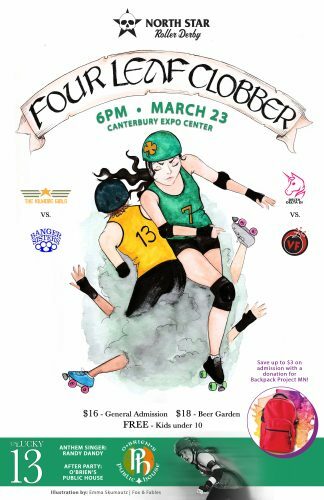 Don your shamrocks and top hats Saturday, March 23 for “Four Leaf Clobber.” This is the last chance for the home teams to advance their standings before the championship. Doors open at 5 p.m. and the action starts at 6 p.m.
We’re partnering with Backpack Project MN this bout. Bring items to donate for discounts on your ticket at the door. You can get $1 off your ticket cost for each item you bring, up to $3. You can find a list of desired items at the bottom of this blog. Once you’re cozy with a beer and a snack, the Violent Femmes and Delta Delta Di go head to head. Neither of these teams has lost a bout yet! Both are hungry to keep up the winning streak but who’s clover will be one leaf short? No doubt we’ll all need a breather after an action-packed first bout, so stretch out and enjoy some halftime entertainment courtesy of Hoop Twin Cities. Next, the Banger Sisters take on the Kilmore Girls. Both teams have struggled to get a solid foothold this season and are no doubt eager to go into their championship rematch with a win. But who will come out on top and reach the pot of gold? It’s sure to be an exciting night of hard-hitting derby action and we can’t wait to see you cheering in the stands! And don’t forget to celebrate or commiserate with your favorite team at the afterparty. This time, we’re all meeting up at the very theme-appropriate O’Brien’s Public House. They’ve even rolled out a drink special and will be sharing part of the afterparty proceeds with us! Backpack Project MN provides backpacks filled with daily-use personal care items to young people experiencing homelessness in the Twin Cities metropolitan area of Minneapolis and St. Paul, Minnesota. All of the backpacks are distributed by Youthlink MN by experienced homeless outreach personnel. 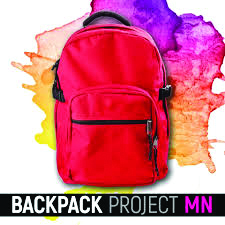 Visit the Backpack Project MN website to learn more about the amazing work they do!